A girl adopted a cat last year while attending college away from home. The next year she decided to go to a college closer to home. Her parents have a dog so they keep the cat in the basement. What’s wrong with this picture? Our pets should be part of our family and although cats are solitary creatures, they do get lonely, require exercise and need attention just like a dog. I have written several blogs about how to introduce a cat to a home with a dog. It is possible to slowly introduce a new pet to other pets in the family but unfortunately many don’t go through this process and discover that their pets don’t get along. I feel that his is not right. 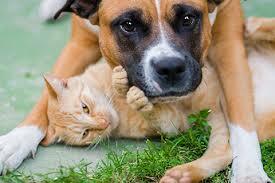 Cats and dogs can get along together if they are given a chance to adapt to one another. Keeping a cat in a dark, damp, lonely basement is not providing a quality life for the pet. It’s sad to see that lots of people really don’t understand how to care for a pet properly. Make sure that your pet has a quality life. If you are too fussy about things like them jumping on the furniture, vomiting on your rug or if you don’t want to make a commitment to spend time and train the pet properly, then do me a favor, don’t adopt one just because you thin it’s “cute.” This is not fair to these poor animals. Give them a good home, lots of attention, good food, lots of exercise, otherwise don’t take them into your home. Oldies all the time on our online oldies station. Edgewater Gold Radio, playing oldies for 17 years. The greatest variety is right here! Ask Alexa to “Play Edgewater Gold Radio” or listen from our website: Edgewater Gold Radio.com. This entry was posted on Friday, March 22nd, 2019 at 8:53 am	and is filed under Pet Supplies. You can follow any responses to this entry through the RSS 2.0 feed. Both comments and pings are currently closed.